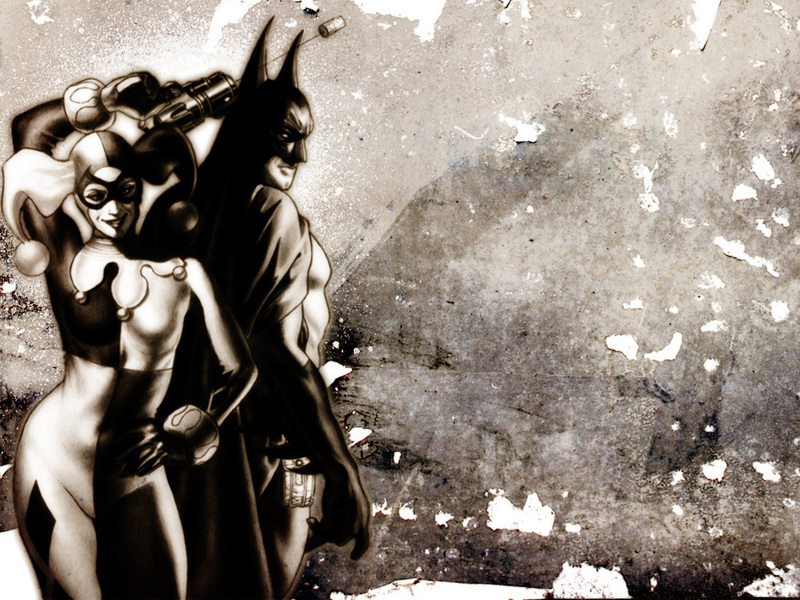 Batman and Harley Quinn. . HD Wallpaper and background images in the Batman club tagged: batman harley quinn comic cartoon wallpaper. This Batman wallpaper might contain straat, stad scène, stedelijke omgeving, stad straatbeeld, and stedelijke instellen. Oh, you guys just disagree with the thought of Batman and Harley Quinn together? Firstly, this artwork doesn't necessarily indicate that they are together as a couple. And secondly, well, sorry, but some people like the idea. I personally like the idea of them together and I like this artwork, but I get that other people don't like it. Each to their own. I like how the bullet is flying between Batman's cowl which portrays the character Harley Quinn truely is. And like Catwoman, gives off her sexapeal that makes you wonder how naughty is this gal. Actually Betsylckes it is not a bullet it is a cork gun, and who ever thinks they are meant to look like a couple are very mistaken as in this comic episode Harley Quin is working with Batman and this is the graphic to fit the story of how they are working together.